When I was a little, I had a friend named Amy. Amy E. And every school day, she would bring with her a plastic sandwich bag overfilled with popcorn. With just a little salt. And a lot of love. But this was more than a few years ago (I stopped counting after my 10 year high school reunion). Before Orville Redenbacher came out with his “new fangled” microwave popcorn, laden with hydrogenated oils and “flavorings” that poorly replicated the taste of butter, popped in carcinogenic bags to scalding hot degrees destroying all the nutritional benefit that might have been in the corn to begin with. Before more than 85 percent of the corn sold in commercial US markets was GMO (genetically modified in a lab to survive massive pesticide usage). And Amy’s dad was probably popping that corn in stainless steel or cast iron (I never asked). Not Teflon or aluminum, which leaches into the food and winds up in the consumer’s blood stream. I haven’t been able to find conclusive studies on it, but Teflon has been linked to cancer … and aluminum … well … aluminum has long been known to contribute to diseases like Alzheimer’s and degenerative brain disorders. I didn’t mean for this to be a “Debbie Downer” post! It’s a favorite snack here in the Cottage. It’s inexpensive (even for organic corn, which we buy in bulk at our local food Co-op). It takes three and a half minutes to microwave a bag, right? Well it takes three and half minutes to pop it on the stove, too. And it’s just so dang easy. 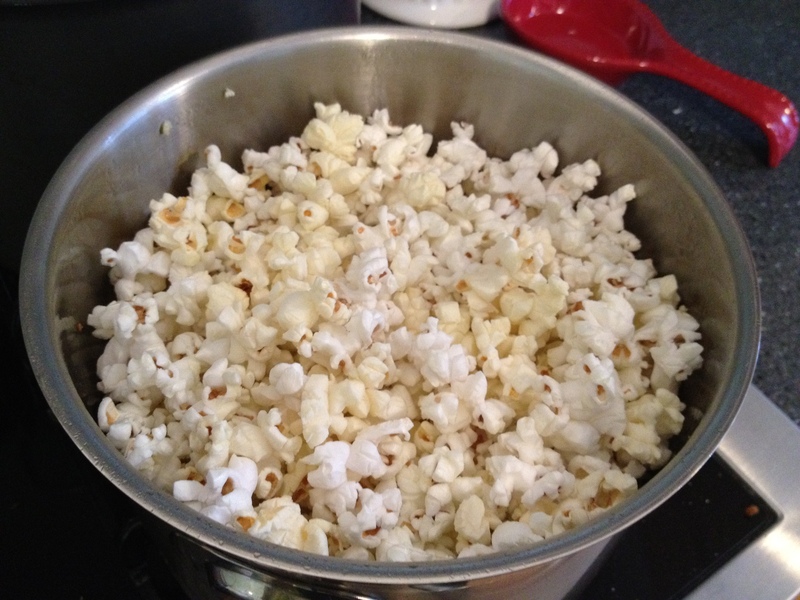 I’m going to encourage you to give it a try, and give you at least one tip that will mean you’ll never burn the popcorn in the bottom of your pot … and be sure to pop nearly all of the kernels. NOTE: I’m pretty sure Amy’s dad used canola oil for his corn. We don’t use vegetable or canola oil in cooking because cooking these oils at high temperatures makes them rancid and indigestible … at least, according to Sally Fallon’s book Nourishing Traditions, which I have found to be an invaluable tool as we continue our journey to a more traditional foods diet. Add the corn kernels. There should be a single layer of kernels on the bottom of your pan. After the first kernel pops, cover the saucepan and start moving it gently back and forth over the heat source. Just like when you’re making microwave popcorn, when there’s a few seconds between each pop, remove from heat, take off the lid, and salt to taste. 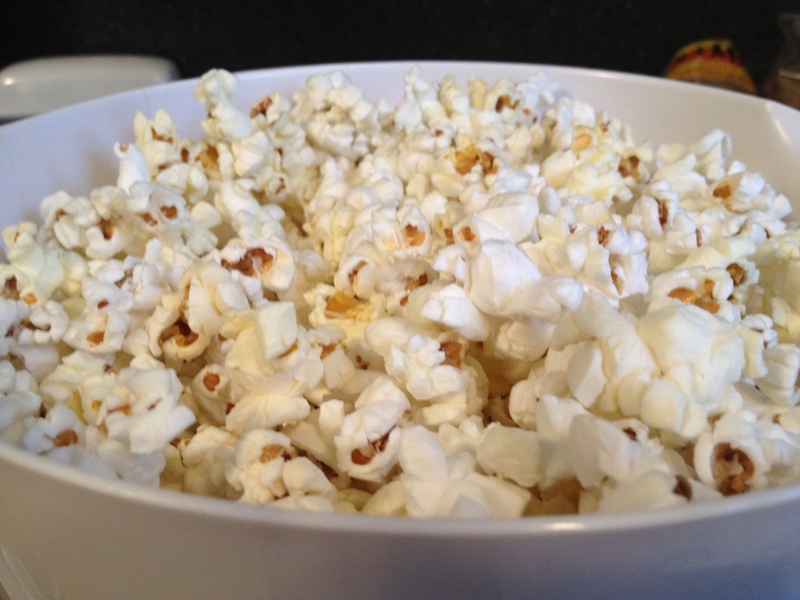 After you’ve added a bit of salt and swished the popcorn around, pour your bounty into a large bowl and enjoy!